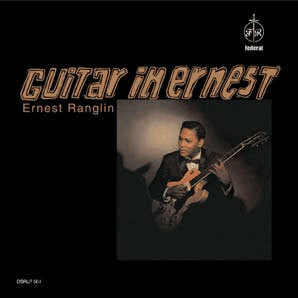 Those who associate Ernest Ranglin solely with the upbeat riddims and tropical timbres of his native Jamaica do so justifiably, but the reissue of Guitar in Ernest offers a reminder of the guitarist’s mastery of straightahead jazz. For both its style and its sound, this 1965 record could just have easily been made for the Contemporary label with the Hampton Hawes Trio as at Kingston’s Federal Recording Studio with pianist Leslie Butler, drummer Carl McLeod and bassist Stephen Lauz. Ranglin, then 33, plays especially lyrically, like Kenny Burrell and Barney Kessel, and hits a relaxed, playful and mellow stride that makes the most out of “Green Dolphin St.,” “Jordu,” while a couple of Ranglin originals (“Ernest’s Tune,” “Ernest’s Delight”) showcase the guitarist’s compositional prowess and technical virtuosity. For a man who helped create the loping rhythms of reggae, Ranglin can be a stunningly fast guitarist. A unique, must-hear take on “Cherokee” suggests that the rest of the group was in similar spirit; I dare anyone to transcribe the delightfully kooky, fleet runs Butler uses to light up the song’s changes. I tried to witness McLeod’s fills without closing my eyes and pursing my lips in a kind of amazed, Bill Cosby grimace. Couldn’t do it. For nearly 70 minutes the grooves dig ever deeper, delivering a genuine Jamaican pulse-no surprise considering the parade of Jamaican jazzmen who lend a hand, including Derrick Stewart, Bo Pee Bowen and Robbie Lyn. But rocksteady beats can’t trump a general lack of inspiration. Though turning in a rousing solo on “Dance All,” Ranglin’ only manages to hang 10 and never really shoots the curl anyplace else. In fact, it’s hard to hear where he or anyone else would find room for dramatic and dynamic playing in the claustrophobically arranged and mixed blend of guitars, keyboards and horns, horn, horns. Looseness might have provoked more imaginative music; instead we get an easily danceable but often artistically stifled effort. Someone needs to put Ranglin in a studio with a scorching jazz trio or quartet and just let him cut loose. There’s no doubt he’s still one of the best guitarists around.